Standing tall on sheer bare rock 122 metres high, Mehrangarh Fort is an imposing sight. 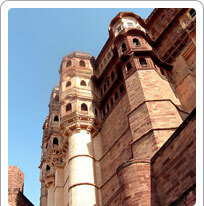 It was earlier called the Chintamani fort and was built in 1459 by Rao Jodha, the founder of Jodhpur. The hill on which Mehrangarh is situated is aptly called the Bakharchiriya or Bird's Nest. The forbidding monument had eight gates to keep away attackers. There is even a maze of towers that would have confused the most enterprising enemy. There are several palaces inside the fort, known for their carvings and embellishments. The fort covers an area of five kilometres. There are several legends associated with the fort's history. Rao Jodha took an extreme step to ensure the new site proved propitious for its residents. He buried a man alive in the foundations. The man was Rajaram (Meghwal) who was promised that in return for his life, his family would be looked after by the Rathores forever. Mehrangarh was named after the Sun God, the deity worshipped by Rathores. Among the treasure troves of tourist delights inside Mehrangarh, Moti Mahal (Pearl Palace), Phool Mahal (Flower Palace), Sheesh Mahal (Mirror Palace), Sileh Khana, and Daulat Khana as well as a museum are the most popular. The museum has a collection of royal cradles, music instruments, miniature paintings, palanquins, howdas and the famous Kilkila cannon. The Chamunda Mataji Temple is dedicated to the Rao Jodha's favourite goddess. He brought her idol from his previous capital of Mandore in 1460 and installed her in Mehrangarh. The original idol was destroyed in a gunpowder explosion in 1857. It was reconstructed by Takhat Singh who ruled from 1843 to 1873. She is worshipped by most of Jodhpur's citizens as well. Crowds throng Mehrangarh during the Dussehra celebrations. Moti Mahal or the Pearl Palace was built by Raja Sur Singh (1595-1619). Moti Mahal was the Public Audience Hall. It has an alabaster throne. It has five alcoves leading onto hidden balconies; it is believed they were built for his five queens to listen in on court proceeding. Latticed screens, superb balconies, the red sandstone coronation seat or Sangar Chokhi and silver howdahs (a special seat for riding on elephants), one of which was gifted by the Mughal emperor Shah Jahan to Jaswant Singh add the beauty of Moti Mahal. Sheesh Mahal or the Hall of Mirrors is a mirror work palace made with large, regular pieces that are superimposed over mirror-work of brightly painted religious figures made in plaster. Phool Mahal is the Palace of Flowers. Made by Maharaja Abhaya Singh (1724-1749), it is a grand room decorated with wall paintings that have European influence. Takhat Vilas was home of Maharaja Takhat Singh (1843-1873) and was also built by home. He was Jodhpur's last ruler to live in Mehrangarh Fort. The fort museum has numerous galleries, devoted to different subjects. The most notable ones are dedicated to Elephant Howdas, Palanquins, Paintings, Turbans and Folk Musical Instruments. The Daulat Khana displays the treasures of Mehrangarh collected over the centuries. The armoury gallery has a rare collection such as sword hilts in jade, silver, rhine horn and ivory; shields studded with rubies, emeralds and pearls; and guns with gold and silver work on barrels. It has on display personal swords like the Khanda of Rao Jodha weighing over seven pounds, the sword of Akbar the Great and The sword of Timur the Lame.